TICKETS ARE SELLING INCREDIBLY FAST!!! ***DO NOT WAIT to buy tickets *** - Saturday is now sold out and Sunday will likely sell out as well - BUY TICKETS NOW!!!!! See you & your friends there! Be sure to "Like" & "Share" above to help spread the word!! Ticket includes admission into the Texas Taco Festival on Saturday 11/17 and includes your first drink free! This ticket includes admission into the Texas Taco Festival on Saturday 11/17 and includes 5 taco vouchers, first drink free, and a commemorative gift bag with a bottle of hot sauce, commemorative shot glass, and giveaways. Beverage Vouchers exclude shots and the Tequila Sampling Expo. 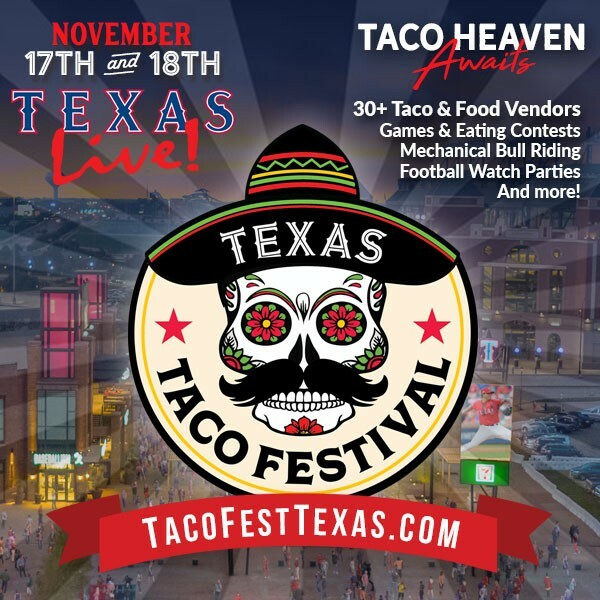 Each VIP ticket includes entry into the Texas Taco Festival on Saturday 11/17, 60 min early entry, 5 taco vouchers, 4 beverage vouchers, commemorative gift bag with a bottle of hot sauce and giveaways, private VIP area with private bathrooms & bar. Beverage Vouchers exclude shots and the Tequila Sampling Expo. This ticket includes admission into the Texas Taco Festival ON SUNDAY 11/18 and your first drink free. This ticket includes admission into the Texas Taco Festival ON SUNDAY 11/18 and includes 5 taco vouchers, first drink free, and a commemorative gift bag with a bottle of hot sauce and giveaways.THIS PRICE IS LIMITED TO 200 TICKETS ONLY! This ticket includes admission into the Texas Taco Festival on SUNDAY 11/18. Each VIP ticket includes 1 hour early entry, 5 taco vouchers, 4 beverage vouchers, commemorative gift bag with a bottle of hot sauce and giveaways, private VIP area with private bathrooms, bar, and limited seating. Beverage Vouchers exclude shots and the Tequila Sampling Expo. Ticket includes admission into the Texas Taco Festival and your first drink free on BOTH Saturday & Sunday. THIS PRICE IS LIMITED TO 200 TICKETS ONLY! The most anticipated food & entertainment festival of the year is taking over the BRAND NEW Texas Live! (located next to Globe Life Park and AT&T Stadium) on Saturday & Sunday, November 17 & 18, 2018! Get ready for an action-packed day filled with a variety of tacos, margaritas, delicious indulgences, and taco themed activities! Game watch parties all day long PLUS Texas's Largest Dallas Cowboys Watch Party in Sunday with Bloody Marys, Mimosas, and more! Access to multiple amazing venues and tons of space!!! Come hungry, get ready for the Texas Taco Festival! Over 75 varieties of tacos will be available, just $3 each. It's time for Taco Heaven! Inside the festival, you'll find over 30 of Texas's best restaurants, food trucks, and eateries serving up an amazing variety of mouth watering tacos & other related food items (mexican corn, churritos, churros, tamales, nachos & more). - Full Access to Texas Live! At the event, you'll find over 30 of Texas's best restaurants, food trucks & carts serving up an amazing variety of mouth watering tacos’s & related food items $3 tacos (sold separately). There will be bars and beverage stations serving margaritas, tequila flights, ice cold beer, water, soda & more. All food items will work on a voucher system – there will be various voucher stations throughout the festival & all vouchers will be used as cash. Additional vendors will be on hand to sell other food (cotton candy, cakes, desserts etc) as well. Multiple ATMs will be on site & strongly encourage cash sales at voucher stations. - Commemorative gift bag with bottle of hot sauce, giveaways, bragging rights, and more! Enjoy the Texas Taco Fest responsibly - stay the night! Discounted Room Rate of just $99. To book your room, please call Marriott Reservations at 1-800-321-2211 and say you are with the Texas Live Event Taco Festival group staying at the Courtyard Dallas Arlington Entertainment District. Grab some friends! - Have a restaurant, food truck or sponsor inquiry? Drop us a line at Info@TacoFestTexas.com or by phone at Call (888) 827-8340. *All tickets purchased for The Texas Taco Festival by phone or online are final. We Do Not issue refunds or exchanges & this is a Rain or Shine indoor/outdoor event. Prices are subject to change with pre-sale and limited availability. Please understand we are only selling limited amounts of tickets for this event. We are avoiding overcrowding as much as possible. We encourage you to purchase tickets beforehand to guarantee access to one of the hottest events this year! View More Events Organized by Texas Taco Fest. Welcome to Taco Heaven at the Texas Taco Fest! This event is organized by Texas Taco Fest.